Women who have ovarian cysts may experience sharp pain if a cyst leaks fluid or bleeds a little, or more severe, sharp, and continuous pain when a large cyst twists or ruptures - this is probably the most common gynecologic cause of acute onset pelvic pain. Fortunately, most small cysts will dissolve without medical intervention after 2 or 3 menstrual cycles; however large cysts and those that don't rectify themselves after a few months may require surgery to remove the cysts. Acute pelvic pain can also be a symptom of appendicitis. Chronic pelvic pain can be intermittent or constant. Intermittent chronic pelvic pain usually has a specific cause, while constant pelvic pain may be the result of more than one problem. A common example of chronic pelvic pain is dysmenorrhea or menstrual cramps. 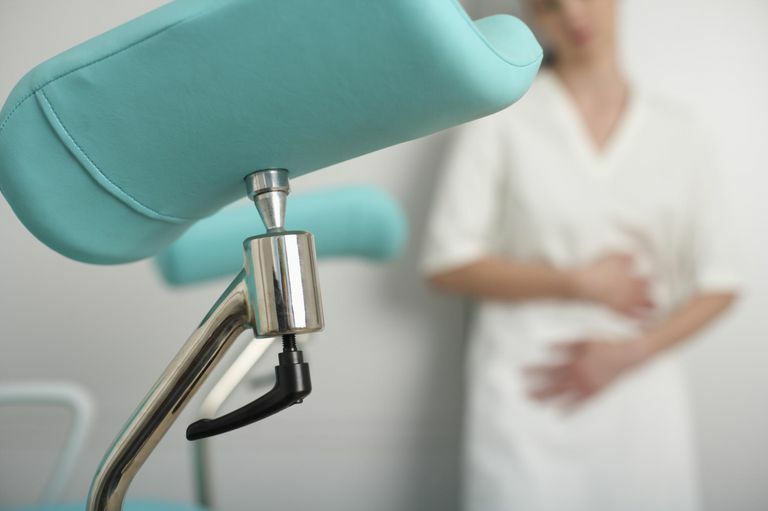 Other causes of chronic pelvic pain include endometriosis, adenomyosis, and ovulation pain. Sometimes an illness starts with intermittent pelvic pain that becomes constant over time, this is often a signal that the problem has become worse. A change in the intensity of pelvic pain can also be due to a woman's ability to cope with pain becoming lessened causing the pain to feel more severe even though the underlying cause has not worsened. Women who have had surgery or serious illness such as PID, endometriosis, or severe infections sometimes experience chronic pelvic pain as a result of adhesions or scar tissue that forms during the healing process. Adhesions cause the surfaces of organs and structures inside the abdomen to bind to each other. Fibroid tumors (a non-cancerous, benign growth from the muscle of the uterus) often have no symptoms; however when symptoms do appear they can include pelvic pain or pressure, as well as menstrual abnormalities.